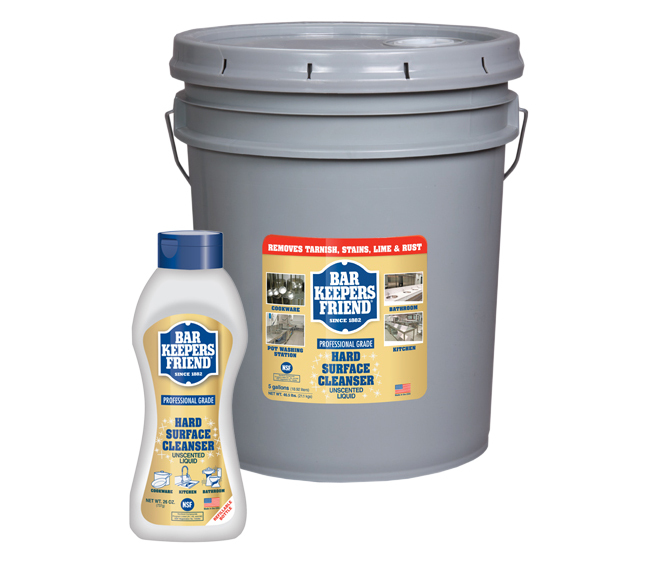 The liquid cleanser choice for foodservice, professional-grade BKF Hard Surface Cleanser removes tarnish, rust, lime, and other tough stains from restrooms, kitchens, cookware, and other surfaces. Similar to our Soft Cleanser but fragrance-free and NSF-registered for food service & processing (A1, A3 & A6 classifications). This bleach-free liquid cleanser is mildly acidic, with added microparticles for gentle but thorough cleaning. BKF Hard Surface Cleanser clings to vertical surfaces and cleans without dulling or scratching—leaving a brilliant shine. Gentler on stainless steel! Wipe with damp sponge or cloth—rub with the grain on brushed metals. Rinse thoroughly within one minute of application. Do not ingest or get in eyes. Keep away from children. Harmful if swallowed. If product is accidentally ingested, drink milk or water and call a doctor immediately. If product comes into contact with eyes, flush with water for 15 minutes. Do not mix product with other chemicals, including bleach or ammonia. For prolonged use or sensitive skin, handle product with gloves. Rinse all food-contact surfaces thoroughly. This product is safe for septic systems. If you want to become a distributor or want institutional end-user info, please fill out the form. Our team will get back with you as soon as possible. BKF Hard Surface Cleanser is great for cleaning vertical surfaces including tile walls and shower doors.